Raisins are delicious and widely known as a healthy member of dry fruits. They are made from grapes that are dried in the driers or in the sun. The drying process finishes when the grapes turn green, black or golden in color. In fact, their crinkble look does not seem attractive to most people, however, raisins are considered as among the healthiest foods around the world. Raisins can be the best alternatives to chocolates or candies due to their sweet flavor. You can eat raisins in raw or even use it in cooking, brewing and baking. Raisins are mostly cooked in pies, desserts, cookies or pudding. Thanks to their package of essential vitamins and minerals that can provide the body with high energy, raisins become top prioritized supplement for mountaineers, athletes and many others. Unlike fresh grapes, raisins are loaded with powerful source of vitamins, electrolytes, energy and minerals. Other nutrients can include folic acid, lutein, carotenes anf vitamin C.
These properties present in raisins have mainly contributed to their numerous benefits to humans’ general health. Following are top 9 health benefits of raisins that should be taken into consideration. Raisins contain more nutrients than their tiny size. One of the most incredible health benefits of raisins is treating constipation. This is due to their insoluble fiber that can add bulk to food which moves through the intestinal tract, hence, providing a good source of relief from constipation. The fiber can also absorb water. In addition to solving constipation, raisins help stop the loose stools by taking in the liquid and decreasing the frequency of contracting diarrhea. 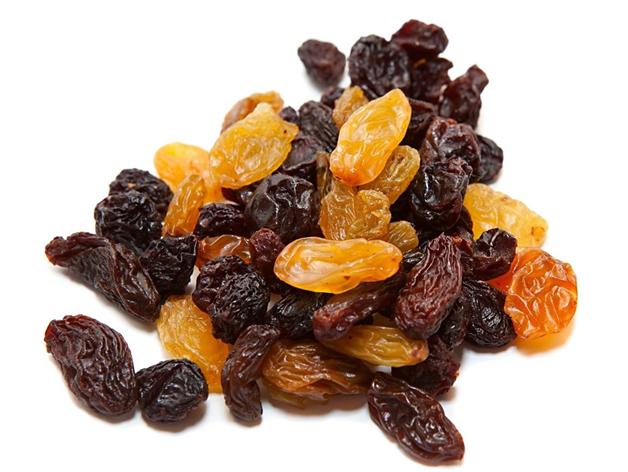 Just like all of the dried fruits, raisins are beneficial for those who want to gain weight. This is because of their rich source of glucose and fructose that can pack lots of energy. Raisins appear mostly in every part of a diet for boy builders and athletes who really want to put on weight without consuming unhealthy cholesterol. Also, they encourage the intake of vitamins, nutrition grabbed from foods and other proteins that can enhance the general energy and the function of immunity. Raisins are good source of eatechins, widely known as polyphenolic anti-oxidants in your blood. The anti-oxidants can scavenge some free radical floating around your body and then wreck the havoc on your cell and organ systems. Basically, free radicals are regarded as a leading causes of developing cancer cells. Hence, adding them to your daily diets can increase the source of antioxidants, thereby preventing you from cancer formation. As you might now know about, this dry fruit packs a high level of iron which supports greatly anemia treatment. Apart from that, vitamin B complex content in raisins are powerful in the production of new blood. Also, the rich level of copper properties plays in important role in the new red blood cells formation. If you are having fever, especially typhoid fever symptoms, then raisins are your best food medicine for you. Another health benefit of raisins are treating fever thanks to the great help of antioxidant, antibiotic and germicidal properties. Those substances are available in raisins with abundant amount to aid in curing fevers by combating with bacterial and viral infection. If you love eating raisins, your eyes are being protected significantly. This comes from polyphenolic phytonutrients that contain antioxidant agents. They extremely benefits ocular health because they prevent your eyes from harmful factors and damage triggered by free radicals. Besides, vitamin A, A-Carotenoid and A-Beta Carotene in raisins are good for eyes health too. You might be surprised at this benefit of raisins, however, this turns out to be one of the most impressive raisins health advantages. Generally, calcium is the major mineral thatsupports the bone well. Raisins have not only calcium but also boron (a micronutrient). Boron is of great help in bone formation and assists in absorbing calcium. Boron does you good by fighting against osteoporosis suffered from women. Potassium is another nutrient in raisins that promote the growth of bone, hence, lowering the risk of contracting osteoporosis in most people. Protecting dental health is another health benefit of raisins since they have a phytochemical which is known as oleanolic acid. The content can support greatly the treatment for tooth decay, teeth brittleness and cavities. It makes the bacterial development stop and prevents teeth breaking and peeling thanks to calcium agent, hence making your teeth stronger. Once again, boron in raisins inhibit the germ growth and whiten your teeth. A recent research has showed that regular intake of raisins has its own ability to prevent against heart diseases. Raisins enhance your general heart health by lowering the cholesterol and triglyceride levels. Risk of strokes, heart attack and hypertension are reduced enormously when eating raisins. Above these health benefits, raisins are safe to use in a wide variety of ways. However, you should take a note that they should not be consumed in excessive amount. Also, those who suffer from diabetes, cardiovascular diseases or liver cancer, it is highly recommended to consult doctors before taking in raisins.